Bushnell 781822 Spacemaster 20-45x60 Spotting Scope 781822 FREE SHIPPING! The Bushnell Spacemaster 20-45x60 is a compact and rugged spotting scope. Its rubber-armored body provides enhanced resistance to shocks and impacts, and it is also completely waterproof and fogproof for safe, reliable all-weather use. Its fully multi-coated optics maximize light transmission to create a clear, bright, high-resolution image with plenty of detail for identifying distant targets. The external lenses feature a Rainguard coating that breaks up water droplets, reducing light scattering for continued visibility. The scope comes with a tripod for stable hands-free use, as well as a backpack-style bag for portability. 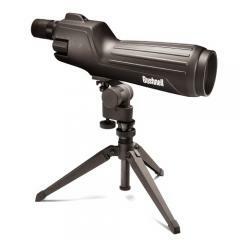 ©2002-2019 CopsPlus.com: Bushnell 781822 Spacemaster 20-45x60 Spotting Scope 781822 FREE SHIPPING!